Mucocele is a common lesion of the oral mucosa that results from the alternation of minor salivary glands due to mucous accumulation. It is usually associated with the history of trauma that leads to severance of the salivary gland duct. Diagnosing is principally clinical whereas the management of mucocele is a challenging task. Treatment options of mucocele include marsupialization, surgical excision, dissection, laser ablation, cryosurgery, steroid injection, and irradiation. This study reports a case of an unusual-sized mucocele on the right buccal mucosa treated with surgical excision. 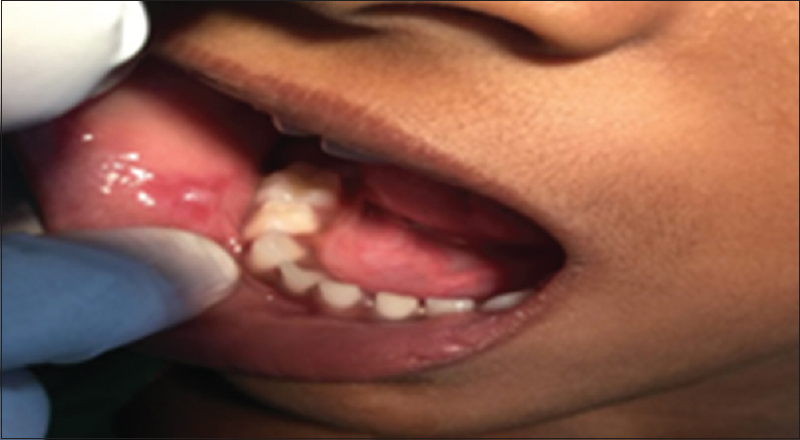 In April 2016, a 6-year, 2-month-old female child was referred to the Department of Pediatric and Preventive Dentistry, Saveetha Dental College, Chennai, India. She presented with the chief complaint of swelling in her right buccal mucosa for the past 1 month. Her medical history appeared noncontributory. 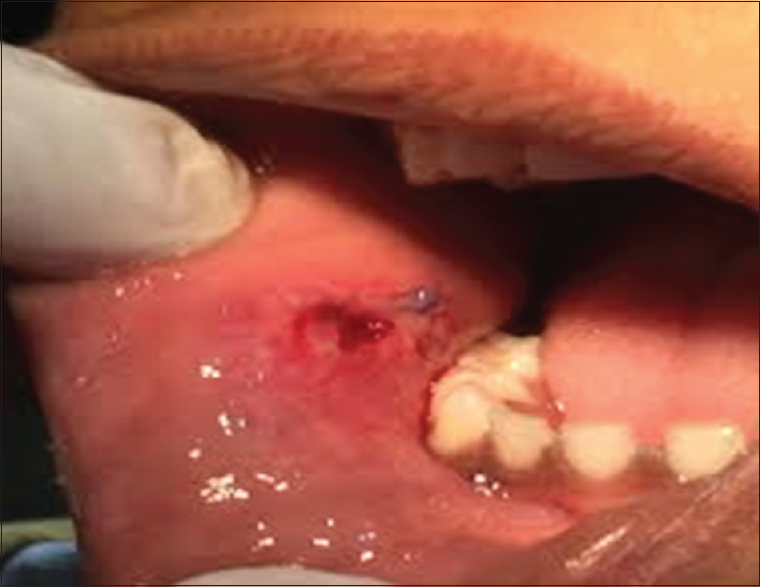 Intraoral examination revealed a nodule of approximately 1.5 cm in diameter covered by a normal mucosa [Figure 1]. The swelling was small initially which gradually increased in size for the past 1 year. On palpation, the lesion was soft and painless. The laboratory investigations such as hemoglobin, total leukocyte count, and differential leukocyte count were conducted and the values were found to be within the normal limits. The differential diagnosis was large mucocele, pleomorphic adenoma and lipoma. A vertical incision was given followed by a gentle dissection of the lesion. Resorbable sutures were placed. 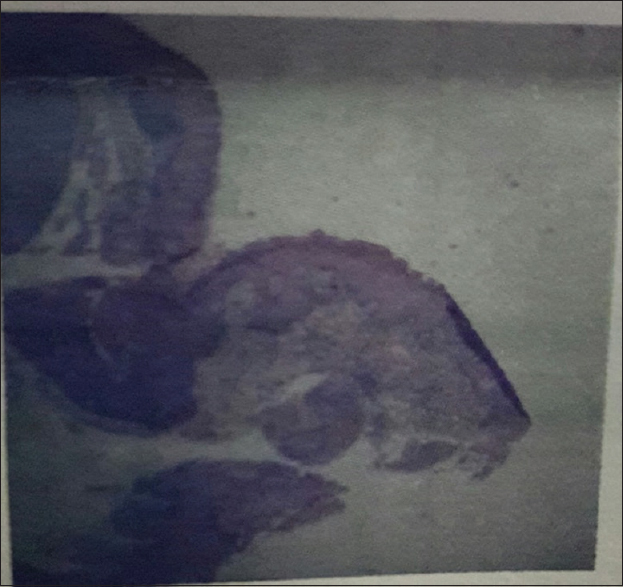 The resected tissue was sent for histopathological evaluation [Figure 2]. Microscopic examination revealed that the section showed areas of mucin pooling surrounded by compressed connective tissue stroma. The connective tissue was composed of endothelial cell proliferation, chronic inflammatory cell infiltrate with moderate vascularity and hemorrhage. Mucous salivary gland acinar and ductal elements were evident. The overlying epithelium is parakeratinized, stratified squamous epithelium of variable thickness. The histopathological analysis confirmed the diagnosis of mucocele of right buccal mucosa [Figure 3]. After 1 month follow-up, there was a total healing without recurrence [Figure 4] and [Figure 5]. Oral mucoceles are common lesions of oral mucosa, very often arising from the rupture of a minor salivary gland duct with subsequent extravasation of the mucus into the surrounding tissue. Two types of mucocele can appear as extravasation and retention type. Extravasation mucocele results from a broken salivary gland duct and the subsequent spillage of the mucin into the soft tissues around the gland. Retention mucocele appears due to a decrease or the absence of glandular secretion produced by blockage of the salivary gland duct. Clinically, there is no difference between the retention and the extravasation type. It is the 15 th most common oral mucosal lesion with the prevalence of approximately 2.4 cases per 1000 people. The diagnosis of mucocele is principally based on the clinical examination. It usually presents as a bluish, soft, transparent cystic swelling which frequently resolves spontaneously. The lesion can be excised completely or can be treated with marsupialization. Other procedures involve cryosurgery, steroid treatment. Recent advances include excision of the mucocele using high-intensity diode lasers. Laser ablation can be performed using CO 2 , Er, and Cr: YSGG lasers. Advantages of using lasers for excision include reduced surgical time, blood free and are well accepted by the patients, no need for suture placement, reduced postsurgical pain and discomfort, and minimal scarring. Large lesions are best treated with an unroofing procedure. Large lesions may be marsupialized to prevent significant loss of tissue or to decrease the risk of significantly traumatizing the labial branch of the mental nerve. The excised tissue should always be sent for the pathological investigation to rule out the salivary gland tumors. We report a case of extravasation type of mucocele located in the right buccal mucosa with no history of trauma or any parafunctional habit. The management of mucocele becomes challenging because of the high possibility of recurrence. 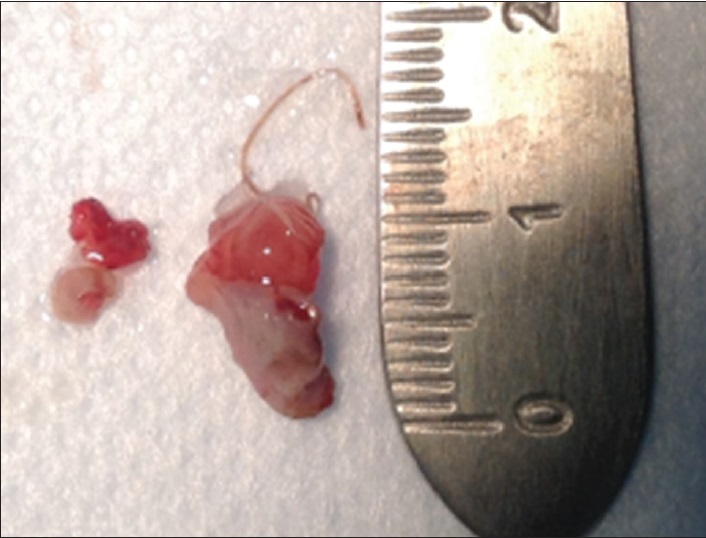 Surgical excision with dissection of the surrounding and contributing minor salivary gland can lead to clinical success without recurrence. Ata-Ali J, Carrillo C, Bonet C, Balaguer J, Penarrocha M. Oral mucocele: Review of the literature. J Clin Exp Dent 2010;2:e18-21. Chi AC, Lambert PR 3 rd , Richardson MS, Neville BW. Oral mucoceles: A clinicopathologic review of 1,824 cases, including unusual variants. J Oral Maxillofac Surg 2011;69:1086-93. Boneu-Bonet F, Vidal-Homs E, Maizcurrana-Tornil A, González-Lagunas J. Submaxillary gland mucocele: Presentation of a case. Med Oral Patol Oral Cir Bucal 2005;10:180-4. Rao PK, Hegde D, Shetty SR, Chatra L, Shenai P. Oral Mucocele - Diagnosis and management. J Dent Med Med Sci 2012;2:26-30. Yamasoba T, Tayama N, Syoji M, Fukuta M. Clinicostatistical study of lower lip mucoceles. Head Neck 1990;12:316-20.